A stark contrast to other seasons, Enterprise’s third season features a season-long story arc stemming from the second season cliffhanger. Desperate to stop an inevitable second attack on Earth, ship and crew transverse the dangerous Expanse in a critical effort to track down the Xindi – a factioned group of multiple subspecies. Ultimately, they come to discover that the threat extends further than the Xindi, with repercussions extending beyond their own universe and timeline. In the Delphic Expanse, Enterprise continues its new quest to seek out the Xindi. Enterprise experiences unusual and dangerous anomalies within The Expanse. Several crewmembers transform into another species on an alien world. Enterprise rescues a mysterious woman from slavatude. An Enterprise boarding party is in grave danger aboard a crippled Vulcan ship while T’Pol experiences extreme negative effects from the Expanse. A lonely telepathic alien insists that Hoshi remain with him as a price for helping the Enterprise with the Xindi. Enterprise works to stop the shipment of kemocite, a critical component needed for the Xindi weapon. Years after the Xindi successfully destroy Earth, T’Pol looks after a disabled Archer, who can no longer establish new long-term memories after an accident years earlier. 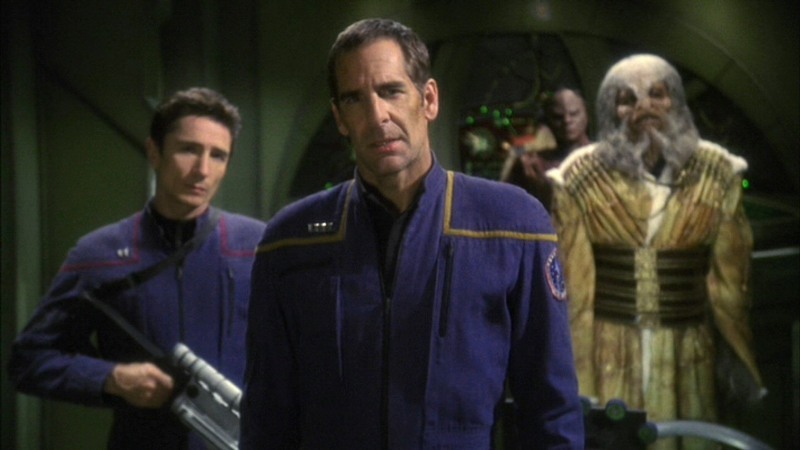 Enterprise discovers a primitive human colony in the Delphic Expanse, whose inhabitants were abducted centuries ago. When Trip is seriously injured, Phlox utilizes a highly controversial treatment. Upon discovering Xindi on Earth during the 21st century, Daniels recruits Archer and T’Pol to investigate. Enterprise is seized by a group of religious fanatics. Shran’s ulterior motives are exposed after offering assistance to Enterprise. Archer tries to trick Degra into revealing secrets of the Xindi weapon. Enterprise rescues a mysterious trans-dimensional alien, tensions mount between Reed and Hayes, and T'Pol and Tucker grow closer. With the rest of the crew in suspended animation, Doctor Phlox mans the Enterprise solely through a trans-dimensional disturbance. An infection leaves Archer compulsive in protecting an Insectoid hatchery. When Enterprise reaches Azati Prime, Daniels reaches out to Archer, who is prepared to take drastic measures to stop the weapon. Badly damaged and facing certain defeat, Archer resorts to sacrificing another crew to save Enterprise's mission. Crippled and mourning, Enterprise rendezvous with Degra to continue negotiations while Tucker confronts his own sorrow. Enterprise is split into two ships - one of which is from the future. With Degra’s help, Archer tries to convince the Xindi Council to delay launching the weapon. Enterprise hurries to rally Xindi support to stop the weapon and rescue Hoshi. With the Xindi weapon en route to Earth, Enterprise races to stop it at all cost.